This cradle securely holds the iPad 9.7" (2017), iPad Pro 9.7" and iPad Air 1-2. Patent pending EZ-Roll’R™ design allows for smooth placement and removal of the iPad while keeping it secure while on the go. This cradle comes with a standard 1” ball installed on the back. For use with other RAM mounting system components. Not compatible with iPad cases. RAM part number RAM-HOL-AP17U. Fits iPad 9.7" (2017), iPad Pro 9.7" and iPad Air 1-2, without cases. Basically it’s a perfect fit. 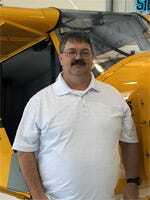 I use the RAM yoke mount in my Piper Cherokee 6. I have the thinnest IPad case and that still makes it slightly too big for this holder. The cradle holds the 9.7 beautifully, the problem I am having is mounting. The Skybolt has a cozy cockpit and I have gone through a number of arms and anchors. The claw, double swivel and the long arm combinations just are not working. Currently waiting for the short arm. Everything I expected it to be. Had the larger iPad before and used a similar ram product also great! Reliable mounting solution for an iPad. The Ram 9.7 cradle replaces the Ram iPad mini cradle I was using before. A simple solution for mounting my new 9.7 iPad. Replaced mini with larger iPad for ease of use. Seems very solid and durable. Upgraded from ipad mini to pro. This cradle was a snap-in replacement for the mini bracket on my yoke mount, just as advertised. 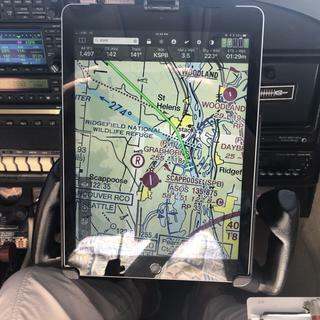 I usually fly with an iPad mini, but have recently decided to try a full-size iPad in the cockpit. I have the new 9.7" iPad Pro, and it fits the cradle perfectly and is held securely. While it seems a bit pricey, it's exactly what I need! Is this iPad Ram cradle for an iPad 4 or 1,2,3? I bought one at your tent at OSH and the 4 is a very tight fit. I also purchased the wrong one for my iPad at OSH. I hope I can return and exchange for the correct one. It is a nice holder. I have a new iPad 9.7. I protect it with an otter box with the removable screen protector. It's not really that thick and was wondering if it would fit in this cradle? BEST ANSWER: Yes it fits. The IPAD does get hot however and I would suggest the X-type holder. So it will fit with the otter box defender case? Sorry, I am not familiar with the "otter box defender case". I use my IPad at home with a clam shell case, then remove the IPad from the case and place it in the cradle. Mine is an iPad air, Not sure what a 9.7 is. It will not fit mine. That particular cradle is made for an unprotected iPad. I used to have a protector on mine but it overheated and shut down twice in flight. Removed the cover and put it in this cradle. No more overheating. Chris, I don't know. My 9.7 fits nicely in the cradle but I doubt it would also accommodate the Otter box. I don't think it will. Just the way the cradle secures the iPad would limit most case covers. I just take the iPad out of my case when using the cradle. I purchased a screen saver and the I Pad air cradle. I have no problem, the units come together just fine and the I pad fits nice and snug. I don't use any case when mounting my ipad pro in this cradle and the fit is snug. Can't say if it would fit with one. Hi I use mine without the leather cover that is pretty thin, but seems to interfere with fit. It is an Air model. The saddle is pretty snug. My iPad 9.7 has the thin silicone protector on it and it has to be removed to fit. It will not fit into this cradle with the Otter Box on the iPad. Will this product work for the new iPad 9.7 released last month? It is thicker than the 9.7 Pro. The new 9.7 depth is .29" (7.5 mm). The 9.7 Pro depth is .24" (6.1 mm). I have an iPad 5. Will this fit? BEST ANSWER: Yes, this is compatible with the 9.7 iPad 5. Do you have any cradles to fit the new iPad Pro (11” diagonal screen measure)? I purchased it last week at the Apple Store. BEST ANSWER: We do not as yet have a form-fitting mount. items 1674 or 2383 will fit the iPad 11". BEST ANSWER: The RAM system can be mounted in several ways, on the yoke, by a suction cup or to the glare shield. 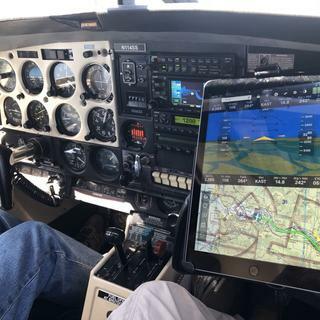 I'm interested in a cradle for my iPad Pro. It measures 9 7/16" x 6 11/16". Is the RAM-HOL-AP17U the correct cradle? BEST ANSWER: Yes this will fit the 9.7 pro. I have a iPad 9.4 height 9.7 Diagonal. This is not the Pro or the Air. I believe it's considered the iPad 4. However it doesn't say that on invoice. It just reads iPad. Just bought from Apple Store in July. Wondering which cradle will fit?. it is by going to apple.com and entering the serial number. galaxy tab E 9.6" ?